Saurashtra booked their third Ranji Trophy final in seven years while remaining unbeaten through the group stage. 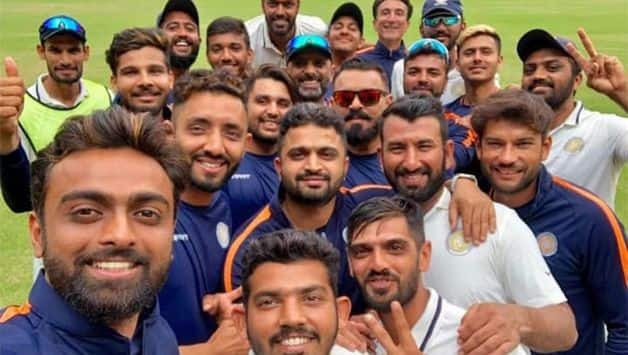 Saurashtra booked their third Ranji Trophy final in seven years while remaining unbeaten through the group stage. They were led by two captains during the season with Jaydev Unadkat taking over the reins in December after Jaydev Shah announced retirement from all forms of cricket. Saurashtra won five of their 10 matches of Elite Group A en route to the final while drawing the rest. They will face defending champions Vidarbha in Nagpur from Sunday. Sheldon Jackson scored a century while Snell Patel missed his own by nine runs as Saurashtra were bowled out for 475 after being sent in to bat in Rajkot. Unadkat took 7/86 as Chhattisgarh were bowled out for 355 in their reply with Saurashtra taking a crucial first-innings lead. which eventually proved decisive. The hosts finished their second dig at 178/5 with the match ending in a draw. Saurashtra took three points while Chhattisgarh had to remain content with one. 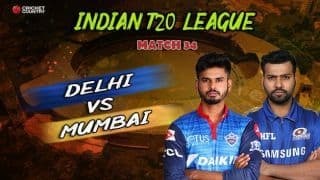 Ravindra Jadeja and Kamlesh Makvana shared seven wickets as Saurashtra bowled out Railways for 200 with the decision to bat first backfiring. Jadeja then starred with the bat as well, top-scoring with an unbeaten 178 with his team finishing on 348- all out thereby a healthy lead of 148 runs. In their second dig, the visitors fared better as they were bowled out for 331, setting a target of 184 runs. In a tricky chase, Saurashtra edged past their opponents despite suffering a mini collapse. Jackson scored a fifty while Jadeja remained unbeaten on 48 as they made 186/7 in 49 overs. Chetan Sakariya (5/83) made Gujarat regret their decision to bat first after he blew away their top order cheaply, reducing them to 89/4. However, the middle-order fought well with Manprit Juneja and Druv Raval hitting fifties while Roos Kalaria top-scored with an unbeaten 91 to push them to 324. In reply, Saurashtra made an excellent start with the opening pair stitching a century stand before they lost their way. However, Jaydev Shah struck an unbeaten 81 to ensure the first innings lead. A vastly improved performance from Gujarat set Saurashtra a target of 306 runs and chasing it they were reduced to 90/5 before the match ended. Saurashtra’s third drawn game of the season but this time they were the ones who conceded the first innings lead in a run-fest. Batting first at home, centuries from captain Jaydev Shah and Arpit Vasavada took them to 521- all out. The response was equally good with Baroda skipper Kedar Devdhar hitting a double-century while Vishnu Solanki scoring 116. The visitors ended the match at 533/9 and thus took the three points. An entertaining tie as Saurashtra recorded their second win of the season. Batting first, Jaydev Shah top-scored with 97 to drive his team to 316- all out before Dharmendrasinh Jadeja took 7/103 to limit Karnataka to 217 and thus hand his team a big first innings lead. The pitch turned into a batsmen’s nightmare in the second dig with Saurashtra being blown away for a mere 79 thanks to a combined bowling display. Chasing 179, Karanataka lost their top-three by six overs for just five runs with Dharmendrasinh getting rid of the openers. He finished with 4/44 while Makvana took a fifer as the visitors folded for 91 in 36.5 overs. Under a new captain in Unadkat, Saurashtra made a winning start in Nasik where they got the better of Maharashtra. Dharmendrasinh starred with another seven-for in the second innings including a hat-trick. A solid batting display from the top-order helped Saurashtra to 398- all out after being put in to bat. In reply, Kedar Jadhav missed his century by just one run but found little to no support from others as the hosts were bowled out for 247. They were asked to follow on and Rohit Motwani’s century helped them set a target of 117. Despite a middle-order collapse, Saurashtra managed to overhaul the target, making 120/5 and thus climbed to the top in their group. A tie that could have gone either way had the teams not been wasteful. Centuries from Jay Bista and captain Siddhesh Lad took Mumbai to 394- all out in first innings. Saurashtra recovered after the top-order failed, led by Jackson’s 95, Chirag Jani’s 85 and Prerak Mankad’s 59. However, they still ended up conceding 46-run lead. Chasing a win, Mumbai declared their second dig at 238/8 on the fourth morning. Saurashtra were left chasing 285 in 72 overs. They were cruising along nicely at 192/3 when a run out ended the century partnership between Vishvaraj Jadeja and Sheldon Jackson. Minad Manjrekar (4/39) raised Mumbai’s hopes but Saurasthra were inching closer. However, after four deliveries in the final over of the day, the match ended with mutual consent. Yet another draw for Saurashtra – their fifth of the season. This time against the current champions Vidarbha. However, by pocketing three points on first-innings lead, sealed their quarter-finals berth. Saurashtra made 356 after opting to bat and then Vidarbha declared their innings at 280/9, handing their opponents a 76-run lead. Unadkat took 6/56 while Sakaria chipped in with 2/72. Vishvaraj Jadeja struck his maiden first-class century as Saurashtra finished the match at 218/2. Bolstered by the addition of India international Cheteshwar Pujara into their squad, Saurashtra entered the semi-final with a record-breaking chase. 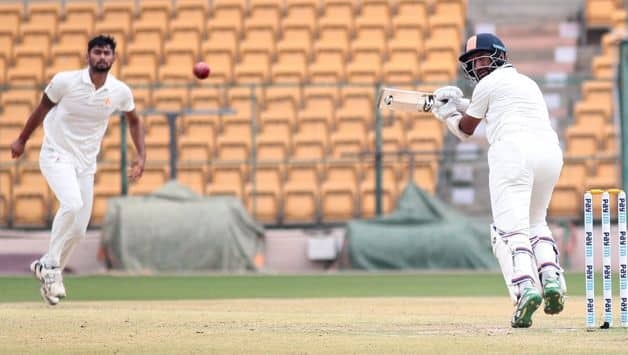 A superb batting display saw Saurashtra hunt down 372 – the highest ever run-chase in Ranji Trophy history to beat UP by six wickets. Rinku Singh’s 150 were vital in helping UP post a 385 and then a combined bowling show saw them bowl out Saurashtra for 208 and thus securing a big 177-run lead. Saurashtra bowlers lifted their game in the second innings as they limited UP to 194 with Dharmendrasinh and Sakariya sharing seven wickets. Thanks to a maiden century from opener Harvik Desai and fifties from Snell Patel, Sheldon Jackson and Pujara, the visitors secured the win with six wickets remaining. A contentious semi-final even though Saurashtra sealed a comfortable win with match-winning centuries from Pujara (131) and Jackson (100). Karnataka opted to bat and Unadkat landed early blows to knock down their top-order reducing them to 30/4. The middle-order rescued them as they were bowled out for 275. Ronit More then took 6/60 to secure first-innings lead of 39 runs for Karnataka. Then, Shreyas Gopal top-scored with 61 as Karnataka set 279-run target to win. However, Pujara was at the receiving end of boos from the home crowd after two dubious decisions went in his favour across the two innings. 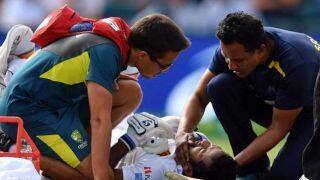 Both times, there was an appeal for a caught behind but the umpire ruled in his favour. The jeering from the crowd was seemingly aimed at him for not walking out despite the replays hinting he might have gloved on one occasion and edged on the second.